Blue Skies is one of those stimulating, hard to put down fragrances once encountered. Its scent is fresh, soft, appealing and totally unique. This fragrance reminds us of fresh air after a rain in these mountains. To give you somewhat an idea of this unique fragrance, I'll give you the listing of different scents that make blue skies. We start off with top notes of bright sun filled citrus oils which is blended with anise oil. These two fragrant delights are placed on mid notes of jasmine, lavandin, warm musk and to bottom the blend is Himalayan cedarwood for a consistent drop down. When deodorizing your home or office with this alcohol free room spray you will be favorably enraptured in how one moment you are smelling bright and clean scents and then seemingly out of nowhere a subtle hint of ceadarwood will rise up to be noticed. Unbelievably complex and intoxicating. Try it in your vehicles, it works wonders. 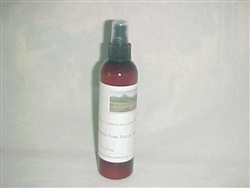 This spray is alcohol free and is room filling and long lasting.